To generations of Coloradans, the name Elitch’s conjures up memories of a safe and classy spot for family entertainment, a well-kept iconic amusement park at 38th & Tennyson in what is now called the West Highlands District. The location included rides, high-quality theater—and a dancehall that enjoyed a nearly 60-year run, the Trocadero Ballroom. John and Mary Elitch opened Elitch Zoological Gardens in 1890—a bandstand, picnic ground and children’s play area, plus a zoo with animals from John’s friend P.T. Barnum. Music was a big part of the entertainment from the beginning, with Pietro Satriano’s band on hand that first day. Before the automobile revolution would make transportation easier, visitors to Elitch Gardens predominantly arrived by streetcar. The theater opened the following year. Rides were added later, with a roller coaster and carousel. John died in 1891; Elitch Gardens (the “Zoological” was eventually dropped from the name) would feature band concerts, and Mary offered folk and ballet dance classes on Tuesdays (although she disapproved of public dancing). Schilling’s Minstrels were billed in 1891, succeeded by Herr Stark and his Orchestra in 1895, and Raffaelo Cavallo’s Orchestra in 1897. An 1899 Denver Times article touted, “The music at Elitch’s gardens (sic) this summer is proving quite a feature. The Friday afternoon concerts have become very popular with music lovers of Denver. Friday afternoon of each week is set aside for either classical music or a symphony and Cavallo’s Orchestra is increased to thirty pieces.” In 1901, the park opened for the season with a free concert from Satriano’s band. In 1916, Elitch Gardens was sold out of foreclosure to John Mulvihill, with two stipulations: the name would never change and Mary could continue living there. New ownership meant new attractions. The Trocadero Ballroom opened in 1917, featuring a dance floor cushioned by horsehair and ringed by four rows of stadium-style seating. According to a blog by Pamela Nowack, formal “white-glove” dances were held with ladies sporting dance cards around their necks, allowing males interested in a certain style (such as a waltz or a polka) to reserve their spot. The first act to play there was Johnny Hopkins. Rudolph Ganz & His Orchestra could be enjoyed for a nickel. Years later, a four-sided lighted sign above the dance floor would let dancers know when a foxtrot, a waltz or a one-step was coming up, “so novice dancers could be sure they were doing the right step.” The dance floor was initially 60 by 75 feet and later expanded to 75 by 200. A band shell in the middle of the floor had another sign that lit up “Request” when dancers asked for a particular song. When Mulvihill died in 1930, ownership was assumed by his son-in-law Arnold Gurtler (with management moving to his sons Jack and Budd in 1945); Gurtler had originally been hired to decorate the ballroom. The Trocadero Ballroom was considered a cheap but safe place for young folks to go for entertainment, with constant supervision preventing any hanky panky (it was also racially segregated before 1948). “The Troc” enforced a strict dress code, with men in coats plus ties and ladies in dresses. Floorwalkers ensured that nobody danced too close or moved their hands to a non-approved position. Miscreants were invited to leave—one being the future first lady Mamie Doud (later Eisenhower), who was dancing too close to her uncle. “If you broke and weren’t holding your partner or were dancing too closely, an usher would tap you on the shoulder,” Denver Post reporter Harry Krueger recalled. The Troc became “the summer home of the big band sound,” as the large outfits needed a stop between California and Kansas City, and Gurtler had a relationship with the booking agency that would become MCA. Radio station KOA would broadcast An Evening at the Troc each Saturday during the summer season for 30 years, reaching some 30 states when the signal was clear. Some of the legendary acts to appear included Les Brown, Sammy Kaye, Louis Prima, Bob Crosby, Ted Weems, Freddy Martin, Gene Krupa, the Dorsey Brothers bands (Tommy and Jimmy), Tex Beneke, Glen Gray, Lawrence Welk and Artie Shaw. Elitch Gardens advertised its 50th year with the stars of Red Skelton’s Air Show, Ozzie Nelson & His Famous Orchestra (long before television made Nelson and his family huge stars) with noted stage actress Harriet Hilliard. Couples attended for a quarter (men fifteen cents, ladies a dime). Tuesday nights in 1947 saw a successful experiment at the Trocadero Ballroom, with Saul Caston conducting the Denver Symphony in a series of pops concerts including Grand Opera and a Viennese Night. 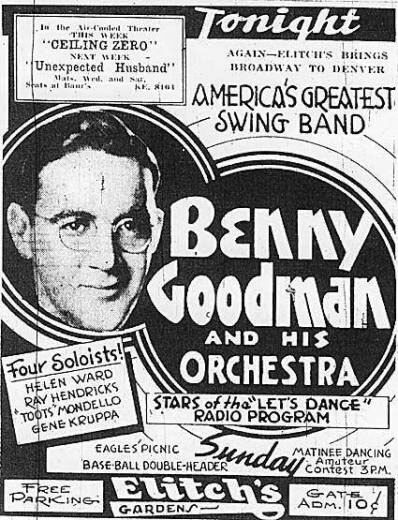 In 1953, the Trocadero was chosen for filming the ballroom scenes for The Glenn Miller Story, a biopic of Colorado’s musical son (though he had never played the room). Stars Jimmy Stewart and June Allyson came to Elitch Gardens along with the Air Force dance band led by sax player Jay Wieder for a 1:00 to 7:30 p.m. shoot, playing such songs as “String of Pearls” and “Little Brown Jug.” For the $1.50 entrance fee (proceeds going to the Children’s Hospital), dancers could be part of a major motion picture (other scenes were filmed in and around Denver, at Lowry Air Force Base, on the University of Colorado campus in Boulder and at Camp Carson in Colorado Springs). The interior of the Troc was decorated several different ways during that afternoon to depict differing locales in Miller’s storied history. The movie, released on Feb. 10, 1954, was a smash at the box office and won the Academy Award for Best Sound Recording. While rock ’n’ roll was taking over the dance scene in the 1960s, a series of concerts were memorialized on vinyl records as Jazz in the Troc (yearly from 1966 to 1969), featuring either the Nine or Ten Greats of Jazz including Peanuts Hucko, Yank Lawson and Ralph Sutton. These well-attended concerts fit in with the park’s catch-phrase: “Not to See Elitch’s Is Not to See Denver.” A single album sold for $6, a double for $10. 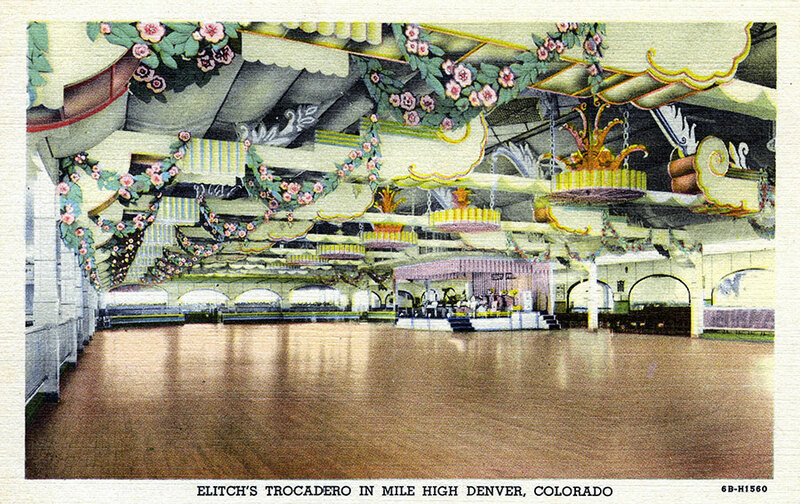 In 1997, the new Elitch Gardens Theme & Water Park in the Platte River Valley of Denver opened the Trocadero Theatre, in honor of the old ballroom, and J.M. Mulvihill’s Pub, which still has a few tabletops made from the old ballroom floor.